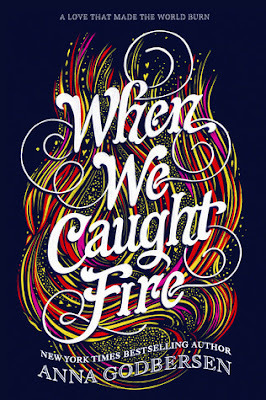 When We Caught Fire is the very first book that I’ve read by Anna Godbersen, even though I’ve had her Luxe and Bright Young Things series on my TBR for the longest. I jumped on the opportunity to read this newest book by Anna, and I was beyond glad to finally read something by her. Unfortunately, while summary for this book sounded interesting, this book didn’t really work out for me as I hoped it would. The first thing that drew me to When We Caught Fire was the gorgeous book cover. (Seriously, I can’t help it! I love a pretty cover!!) The story set during the 1870’s, and revolves around the well-known Chicago Fire. That alone made me curious, as I’m trying to read more historical fiction stories, and this sounded right up my alley. Those parts of the story I did enjoy, especially the descriptions of the time period and the absolutely tragic event. I don’t think I’ve ever read a book about that before, so I was really curious, and horrified by what happened. (And, of course, once the story was over I HAD to look up as much information as I could on the event.) This was definitely the most interesting part of the book for me. With that being said, there were a lot of things about the book that were a bit harder for me to enjoy. For instance, I had a really hard time connecting with ANY of the characters in the book, which doesn’t happen really often to me, and felt a little weird. I didn't really buy the love triangle either, to be honest. The story was also a bit on the slow side, and I found my mind wondering from time to time, making it hard to focus as I tried to read. It did pick up a bit at the end though, and I did finish the book all the way through, and I am glad that I did. Overall; While I found When We Caught Fire to be an intriguing read, I didn’t enjoy it as much as I had hoped I would. The storyline was interesting, but also slow paced, and I didn’t really connect with any of the characters as well. That being said, if this book sounds interesting to you, do check it out! Just because it didn’t work for me, doesn’t mean that it will not work for you. *smile* And I’m still interested in checking out Anna’s other books, as I’ve heard nothing but good things about both the Luxe and Bright Young Things series. I’m hoping to work those onto my TBR soon! I'm rather curious about this book. I'm in LOVE with Chicago since I lived there 3 months and it was amazing, I'm wondering if I would like this book and how I would feel about the characters. And I agree; The cover is amazing! I thought the concept of a book about the Chicago Fire was really interesting. Too bad it didn't quite live up to your expectations.